Attempts to retrieve Irish tricolour swiped by steward. 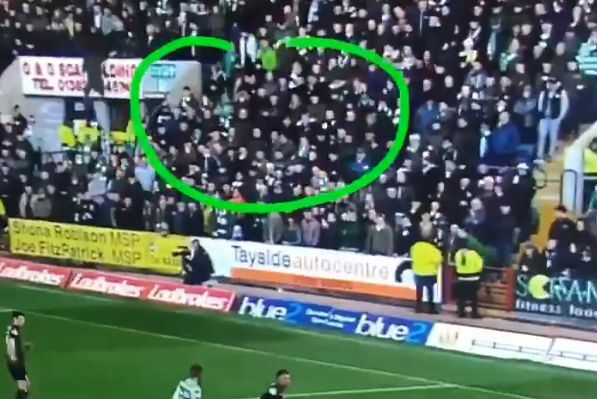 A Celtic fan jumped down from a stand in an attempt to retrieve his Republic of Ireland flag from a steward who removed it at Dundee’s Dens Park. The match took place on Sunday, which was St. Patrick’s Day, but the steward in question did not see fit to allow the tricolour on this basis. He can be seen in this clip swiping it away and taking it inside, but he is hotly pursued by its owner who scales an advertising board and drops down. They then argued about it in the concourse area, which was also caught on camera. In the game itself, Neil Lennon’s Hoops won 1-0 thanks to a 96th minute strike from Odsonne Edouard.